As the summer approaches it brings with it the 2015 Regional Conventions of Jehovah’s Witnesses. This service year people around the earth will be invited and delighted to attend the “Imitate Jesus!” conventions. As much as the conventions days are a joy to attend, many of us want to stretch the joy over the following months by reviewing well-taken notes. This year Jehovah’s organization has thrilled many of us by releasing an new interactive program [available here]. This new interactive program is formatted to help convention goers to take better notes. The program includes linked talk titles and songs. Yet many have wondered, what is the best app for taking notes on the new interactive program? We’ve tried a number of note taking apps with the new interactive program. Many of these can be found in our list of the best file management apps for iPhone and iPad. But one app stands out above the crowd as the best. That is PDF Expert. Actually, PDF Expert is our favorite app for storing, reading, and annotating PDF documents. Not only does it handle PDFs beautifully, it will also store and play videos and music. You’ll be able to view Microsoft Word, Excel, and PowerPoint documents too. So the app is definitely worth the investment! If you’re looking for cheaper alternatives,check out Easy Annotate and JW Companion. They too handle the interactive program well, but that are less refined apps overall. Once you’ve downloaded PDF Expert, visit JW.org at this link to download the interactive program. Then instead of tapping Open in iBooks in the upper right corner, select Open In… in the upper left. This will bring up the option to open the program in PDF Expert. 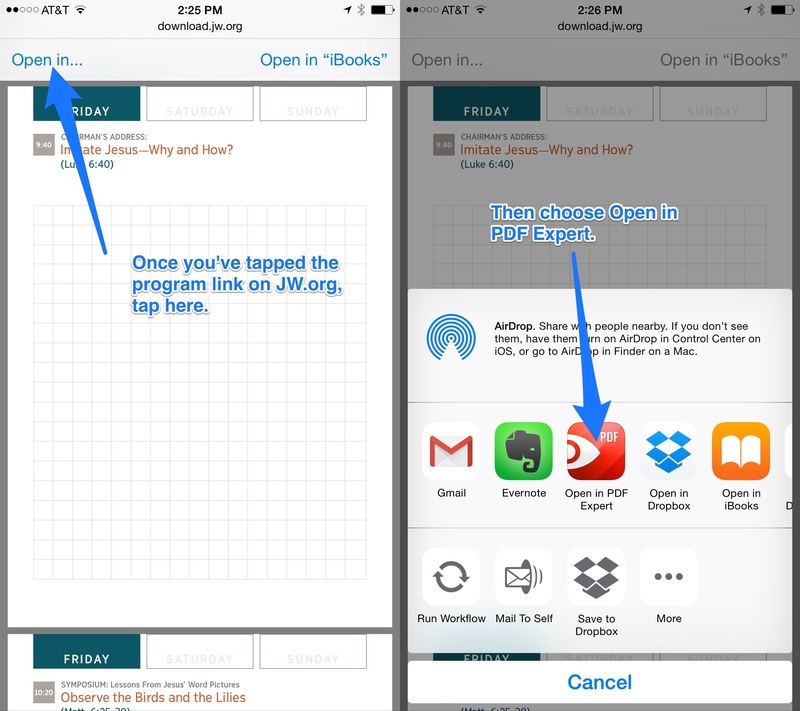 If you’re planning to use your iPad to take notes at the convention, don’t forget to use the four-fingered gestures to swipe between the JW Library app and PDF Expert. Just drag four of your fingers across the iPad screen to quickly switch between open apps. Getting ready for the 2015 conventions is almost as exciting as the convention days themselves. And now the interactive program will make it that much easier to pay attention to the spiritual banquet as it unfolds. If you’ve found exciting ways to use PDF Expert in your theocratic routine, or you have questions about the app, let us know in the comments below! If you would like to explore using the interactive program with other apps, check out our video review of Notability. I have downloaded App. And have the interactive program for the convention in the PDF, in a folder,, but I can not get the interactive feature to work. What have I done wrong? Hi. Are you using PDF Expert to view the interactive program? Typing on the screen is never great. I think if you really want to avoid losing concentrate on the talks and demonstrations and don’t want to stick your eyes on the screen, a Bluetooth keyboard is a must. I tap the file and nothing opens. Has anyone else had that problem? Where are you having the problem? In Safari? Or in PDF Expert? Can I also take notes with a stylus instead of typing? Yes PDF Expert has a pen tool that would work with a stylus. Thank you for this great recommendation. I have shared your article with friends and family. I also like that I can use the interactive program and sync to Dropbox to have my notes with me anywhere. I don’t toe my notes, I prefer handwriting and I found this app’s way of zooming in and scrolling the best I’ve seen. I had tried the interactive program on GoodReader and although it worked I wasn’t happy with it’s handwriting feature and erasing was hard. This is my new favorite app. Wow that’s great! I’m happy you enjoy PDF Expert. And thank you for sharing the article with your friends and family. I hope they can get some helpful suggestions from the article and the rest of AppChasers.com. Have a good day! I am having a lot of problems trying to open PDF Expert. I downloaded Expert, then downloaded the Interactive program and said “Open in……..). However, when I tap on the file, nothing happens. I had Itunes refund my money because the program was not working. Is there another APP you recommend? Yes, I’m having the same problem. App not opening. I’ve tried calling and speaking with Itunes, but they don’t have a clue how to fix or even assist you with the APP. Please contact the app developers at http://www.readdle.com/support and let them know your issues. They are very responsive and helpful. Hi Jacqueline, I’m sorry you’re having trouble with PDF Expert. I hope the developers will help you get it sorted out. In the meantime, you might also want to check out JW Companion here: http://appchasers.com/2015/05/13/review-jw-companion-for-iphone-and-ipad/ It handles the interactive program well, but it’s not as refined an app as PDF Expert. I’ve been looking for aa app to use the 2015 interactive convention program and have noticed that over the last few weeks the cost of PDF Expert 5 has doubled! Why is that? Are there other cheaper alternatives out there? Hi Mario. You probably started looking at PDF expert while it was on sale, and now the price has gone back up to its normal $9.99 point. If you’re looking for cheaper alternatives,check out Easy Annotate and JW Companion. They too handle the interactive program well, but that are less refined apps overall. How do you compare this app to notability? I really don’t want to have to buy this app, then it not be as nice as notability. Thanks. Hi. Notability is a very nice app. But the interactive links in the program won’t work in Notability. Hello and thank you so much for taking the time to explain all the details! For those of us that are interested in using a free app, will Evernote work with the interactive program? Hi. You’re welcome! Well Evernote is not free if you want to annotate PDFs. That’s an extra charge. And even then, the interactive links do not work. So I would advise staying away from Evernote. Will the interactive program work in pages? I really like the note taking template pages has but want to take notes on the interactive program. I have not been able to find a way to open it in pages though. Also does PDF expert have the ability to tab within the text notes in order to create more of an outline style note taking? I have PDF Expert 5 as well as the free Documents app, both by Readdle. When it comes to taking convention notes, both apps seem to be mirrors of each other. Not sure now if I needed to buy PDF Expert 5 (I had already bought it prior to reading your reviews). Am I overlooking something? Hello. Unfortunately it will not work in the Pages app. Wow! Thank you so much! This is an excellent review and tutorial. I was very excited to see that the Brothers made an interactive Convention program. I already downloaded PDF Expert. During my research I already had it in my mind that I would have to download many apps and test my precious program several times for the best note taker PDFs app to use. And then II came across your video and article. I was overjoyed to see one of the friends reviewing the exact document I wanted the app for. What a beautiful surprise. I truly appreciate you taking the time to share the best app for this very important event program. I plan to join and look through your other posts. Thank you very much for your kind words. I hope the site is valuable to you and other friends in saving time finding the best apps. Does PDF expert have the ability to tab within the text notes in order to create more of an outline style note taking? Hi thanks for the question. I just checked and no it does not provide that kind of formatting. Hi! I was wondering if you could tell me how to add pages to the Interactive Convention Program. I have an iPad with JW Companion. I’m an older person and not too tech savvy. Thanks! I know this video shows it being used for an ipad or iphone but I have a Samsung Galaxy Tab 3. Will the app work with it? Hello. Thanks for asking the question. No PDF Expert will not work on Android devices. Does anyone know of an equivalent app for Android? Thank you for quick response! I researched and found that PDF Max Free or PDF Max works with android. I have downloaded the Free version for now and it is working with my Android and looking pretty good! Ugh. I just bought this PDF app for the convention program and that works great for writing notes but the scriptures themselves aren’t “clickable.” Ok not a big deal but then I opened the Study Edition of the watchtower and the scriptures aren’t “clickable” either. In iBooks you can click on the scriptures or links to other articles, footnotes, etc and they open up. ?????? Thank you!! I didn’t do view the video yet but I plan to asap. ? ?